We weeded in my mom’s church community garden plot this morning. Robyn and I joined a work party cleaning paths and rototilling the winter overgrowth in the 12 x 25 foot plots. They were working within a small time window while the clay soil was moist and workable. Another few weeks here in California’s San Joaquin valley, and the soil would be like bricks. (photo: Janaia’s mom Rowena, center). As I pulled weeds in the gentle sunshine amid sonorous mockingbirds, I thought of community and family gardens starting to be worked on everywhere. This garden is barely a year old, and part of a growing movement across the continent (okay, pun intended). A welcome movement towards relocalizing food. As I pulled weeds, I thought of the gardens we’ve visited and taped, most recently several community gardens in the Pacific Northwest. From them, I passed along two seed ideas to this garden’s coordinator for future consideration. 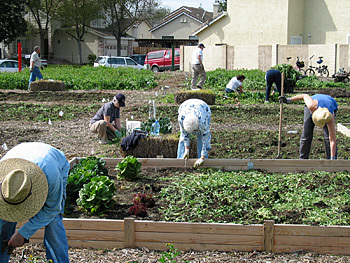 One is to create a community garden rather than separate plots. It could be a neighborhood garden like Judy Alexander helped coordinate in Port Townsend (video forthcoming), or the Wendell Berry Garden that John and Maia O’Brien showed us in Olympia, Washington. Rather than waste a lot of space with paths around separate plots, there is one large garden — rows of squash and beans and beets and lettuce and much more. Participants share in the decision making, the work, and the harvest. This structure uses people’s strengths and capability, rather than each person having to do it all on their own plot. As Judy Alexander remarked, someone who may be physically incapable of physical garden work can do the bookkeeping. Those who are more knowledgeable can teach the newbies. As John wrote, their garden structure “enables … very high productivity and quality, since we decide collectively what we grow, how much, what variety, etc. instead of 20 little plots each with their 3-4 broccoli plants.” It also permits growing a wider variety of crops and encourages biodiversity. And it trains people collaborative decision-making, democracy at the grass roots level. Or the beet roots level, in this case. The second idea comes from our friends Llyn Peabody and Chris Burns, coordinators at Alpine Sharing Garden in Oregon (meet them in my blog A Sharing Garden That Grows Community, video forthcoming). Their garden is planted as described above — one large garden whose produce is shared by participants, with surplus going to the local food bank. The beds are highly mounded. Both the beds and walk spaces between are heavily mulched with straw. I mean heavily — many inches thick! The thick straw keeps moisture in and weeds down. Chris pulled aside some mulch to show the earth below providing habitat for bacteria and bugs and worms happily at work building soil. He pointed out plant roots stretching into the walkways, expanding the growing space. And of course the straw breaks down to help build soil. Like these examples, I’m sure there’s a lot of creative genius at work in the gardening movement, flourishing along with the plants. May the movement spread across the land, in every vacant parcel urban, suburban, rural. It produces not only fresh local delicious often-organic beautiful real produce, but also people reconnecting to the living earth and one another. It doesn’t have to be an either/or–either all individual plots or all one big shared garden. On the privately-owned community garden that I’ve established, we have 6 individual plots, plus 2 large cooperative plots where a number of folks garden together. I work in both co-op plots, as well as having large personal garden areas of my own. I also work in a friend’s garden in exchange for her giving me violin lessons. I’ve also had folks just help me out in my own gardens, for a share of the produce. So there are many different possibilities. Some folks really want a patch of their own; others treasure the sharing of a cooperative effort. Viva diversity! Let’s have a lot more of every kind of garden possible! it involves more people. We could produce more veggies per acre by not dividing the garden into a number of plots. But by doing so we involve many more people and people is the business we are in. Each plot usually involves a family and even extended families. It is a great experience for those who are involved. The miracle of God is that the seed, with the right environment, of sun, soil and water will reproduce itself and more too. What is true in the garden is true in all of life. The more people that are involved in this learning experience the greater success our garden is. I appreciate you sharing your ideas with us. Establishing this garden area for the community in Tracy has been quite a learning experience and we continue to learn. 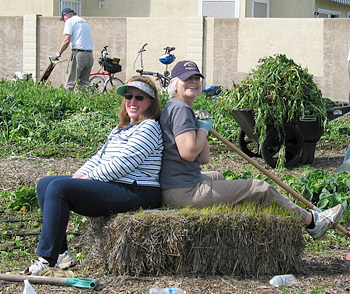 We knew nothing about community gardens 16 months ago. I couldn’t agree more about the concept of the “sharing style” being a more efficient method of farming. We will continue to nurture that idea as we develop the available space on this lot. We welcome suggestions and we thank you for sharing. Just a note: the plots here are 12ft x 25ft (300 sq. ft). Love the mention of our garden! We have worked very hard to get it going. Thank you very much for coming out and helping! Always a pleasure to see you and Robyn. One other note, at the back end of the garden, we set up four `super plots, with no lateral paths’ that could be used as more group plots. But we haven’t thought all of it through just yet. Thanks for the great ideas. We will certainly take them under consideration. Janaia – Great to see how you are integrating your expereince in the various garden-projects you’ve taped in the last 6-7 months. You’ve really captured the essence of what makes growing gardens in the “sharing-style” (one large garden, instead of many separate plots) so efficient and beneficial for growing food. Two other benefits that we see in our gardens: Watering can be done so much more efficiently and weed/pest management is far simpler since you don’t have mini-arms races between neighboring plots –each competing to rid their OWN plot of whatever ails it, hence foisting the problem on neighboring plots. Keep up the good word (See, you’re not such a “brown-thumb” after all!